Many companies have re-designed their workspaces in response to the work of incredibly successful companies such as Google and Apple who have been creating workspaces that are not only cool, collaborative and full of tech, but future-proof. For them, the proof of the power that an innovative working space has on an organisation is in their staff’s happiness, loyalty and their profit margins, which continue to boom. So what are the biggest workspace trends of 2017 looking like? The biggest trend to follow on from 2016 is the employee and candidate experience leading to talent attraction and retention. This trend will increase in 2017 as more and more companies are realising the connection between a positive employee experience and hiring the best talent. In a recent candidate experience study by workplacetrends.com nearly “60% of Job seekers have had a poor candidate experience and 72% talk about it”. And with today’s wide outreach and means of messaging, this could negatively affect a company’s ability to attract top talent. In 2017 more companies will invest in this to enhance the overall experience for their employees of the future and increase their welfare, becoming better places to work, and stronger talent magnets. Employees are important customers that need to be satisfied, as they are the most valuable asset and at the foundation of the brand. So, not only are organisations giving current employees what they need to work effectively in their environment, they are also using the workspace as part of their recruitment process, as a tool to attract better talent. This was evident when we toured offices during Workplace Week. At JLL they highlighted that they always show candidates their 5th floor in particular, which features many collaborative spaces and popular booth seating areas to encourage teamwork and disruptive encounters. 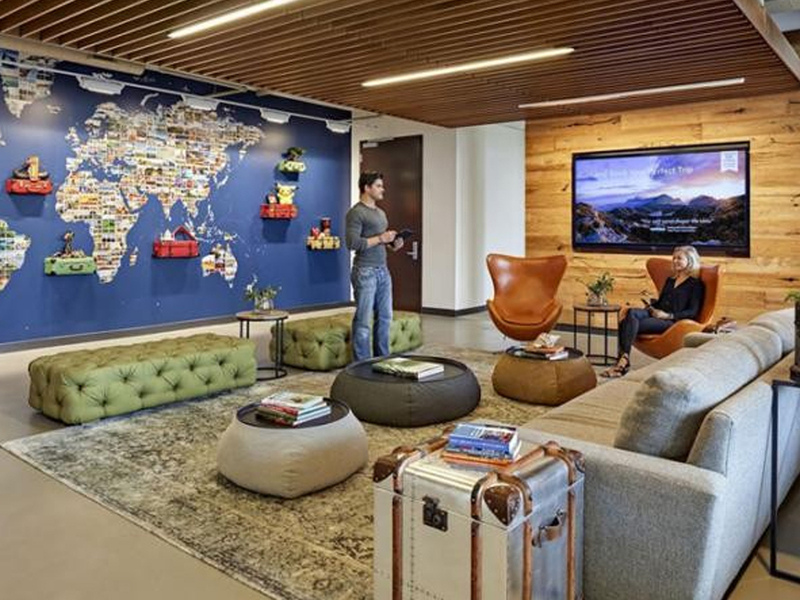 JLL offices also focused on the employee and visitor experience following their decrease in office space, reducing their footprint per person from 76 sq.ft to 59 sq.ft. Their space includes a concierge service to greet and look after employees and customers and a genius bar for employees to take their equipment to be fixed or gain extra training. Since the workspace improvements, JLL estimate an additional 3-8% extra revenue, and an increase in productivity within their workspace as well as improved employee happiness. One of the biggest computer hardware companies; IBM have developed a way of using people analytics to predict retention red flags within their workspace. They have also created a program called The IBM Corporate Service Corps – a professional development and service allowing their employees to work abroad on team assignments for a month which is used to attract talent to work at IBM and retain their current talent too. “Eight out of 10 participants in the Corporate Service Corps program say it significantly increases the likelihood of them completing their career at IBM,” Stanley Litow, VP of Corporate Citizenship & Corporate Affairs. Improving a workspace for candidates experience is at the forefront of CEO’s minds for 2017. And with large companies such as IBM and JLL paving the way to improving the experience, we know that a number of companies will follow this trend in order to attract the right talent to their business while increasing positive reviews too. This trend was a re-occurring theme last year, and will become a top trend this year, as we notice how companies are introducing environments and systems, where everything is configured for mobile devices, to cater for design and digital teams to improve productivity in their workspace. The advances of technology are disrupting almost every market. So in order to prosper, we all need to act like a tech company and deliver the best personalised experience that our customers are looking for. Tech-enabled spaces and connectivity help to achieve this, and allow employees to work seamlessly during their day with the use of furniture that is designed to enhance project and meeting experiences, such as app-controlled facilities, power distribution and wireless charging, smart connectivity, cloud based solutions and SAAS. One company that welcomed tech-enabled spaces with great results is RBS. They created a Digital Studio for their digital team which allowed them to work in an agile environment. This gave employees flexibility with collaborative and breakout areas and walls embedded with tech features to enhance their work-life, with greater and simpler connectivity on a larger scale for easy presentation. After the completion of their new digital floor, RBS sent their staff a workplace survey. The results showed that since completion of the space, which was designed to encourage collaboration and increase overall happiness in the workplace, employees noticed a difference in culture and a positive change in the working environment too. Companies are noticing the rise in tech-enabled spaces and dynamic furniture and how they are making a positive difference to an employee’s lifestyle. The focus on technology has influenced workplace design as well, with combining integrated tech features with quality, adaptable furniture. “Spaces are being designed to accommodate what the technology can offer now” says David Roberts, International Director at JLL. Ten years ago, technology costs represented only 7% of a company’s interior construction budget. Now, they can consume 25% or more of a total build-out cost. In 2017, the spotlight will be on tech-enabled spaces as a way of retaining the new generation of talent and making their workforce more efficient. Millennials are changing the workplace, and more so in 2017! An article written by Forbes expressed how they are “disrupting the workforce for the better” so the workspace has to be designed to attract and facilitate the way they work. They are adaptable individuals who can bring new ideas to the workplace – they offer a new way of thinking, being the first pure tech generation. The increase in millennials in the workplace means that more companies are having to adapt their environments to support and retain them. In America alone, millennials are now the largest generation and have outgrown baby boomers who were the biggest generation until 2015. With this in mind, it’s important to understand exactly what a millennial wants in a workspace. Our research shows that younger workforces seek social interaction and collaboration, they live on their phones, need flexibility and they share everything. Workspace dynamics and generations are rapidly changing. Traditional office designs and spaces have also changed to retain this new generation of talent. Millennials are transforming the workspace world as companies are encouraging collaboration with spaces designed to facilitate teamwork. And in 2017 more moves than ever will be made to appeal to this younger workforce. The idea of collaborative working was taken up by Apple businessman Steve Jobs. He believes that environments that promote and facilitate teamwork can help companies retain their talent by introducing the thought that everyone in the office can work together – no matter what the role or authority. But there’s also the thinking time. So today’s knowledge worker needs a choice of workspaces for maximum productivity. There’s a major societal shift occurring around the world, and that is that there’s a new organisation. 10 years ago, there was a leader and a chain of command. Today, companies are a complex network of teams, and this is revving up for 2017. Empowered teams are made up of people with different skills, experience, and knowledge but a comparable rank in the company. This can increase their creativity and problem-solving potential and give a team a broader perspective on a project. So the office space has to be configured in such a way to facilitate teamwork, providing open spaces for collaboration. But make sure your workspace design strikes a balance between working solo and putting the best brains together. As collaborative working environments increased last year, we’re certain that more companies will tailor their workplace to suit the needs of the new generation of talent that they aim to attract, whilst bringing together current employees to nurture culture and teamwork, and to strike the next big idea that will change the world! Informal, natural, healthy. The trend for indoor biophilia is expected to flourish in 2017 as its association with well-being and productivity is recognised. Biophilic design was a term that was popularised by psychologist Edward O Wilson in the 1980’s. He discovered how the increasing rate of urbanisation leads to a disconnect with the natural world. Biophilic design is a concept that enhances the spaces we work and live in and comes with many health and well-being benefits including a “6% increase in productivity, 15% increase in self-reported well-being and 15% increase in creativity” according to a recent Global Impact of Biophilic Design study by carpet tile manufacturer Interface. A great example of the biophilic design concept in a workspace is The Genzyme building in Massachusetts designed by Behnisch Architekten. The Genzyme Centre owned by biotechnology company Sanofi Genzyme reflects their commitment to the environment and the community and is also registered under a voluntary consensus-based national standard of developing high-performance and sustainable buildings – The Leadership in Energy and Environmental Design 2.0 standard. Their workspace is a stunning example of a biophilic workspace with natural light filling the space, greenery on each floor and glass facades that offer employees a clear view of the natural textures and open spaces. These key features enhanced staff’s well-being by 88%! And to tie in perfectly with this trend, Pantone have announced that their colour of the year is ‘Greenery’ – a fresh and revitalising shade representing the first days of spring, the great outdoors and symbolising the reconnection with natural settings. “Greenery bursts forth in 2017 to provide us with the reassurance we yearn for amid a tumultuous social and political environment. Satisfying our growing desire to rejuvenate and revitalise, Greenery symbolises the reconnection we seek with nature, one another and a larger purpose” Leatrice Eiseman, Executive Director of the Panton Colour Institute. With large creative companies such as Google and corporate biotechnology company Sanofi Genzyme using this concept in their workspaces and research validating the potential of this trend, in 2017 more companies will introduce this concept in their offices to enhance employees work lifestyle and well-being.